Unilever's thermometer plant in Kodaikanal exposed many workers to mercury poisoning, without giving them any protective equipment or information about the disastrous health effects of mercury. Unilever's thermometer plant in Kodaikanal exposed many workers to mercury poisoning, without giving them any protective equipment or information about the disastrous health effects of mercury. This toxic mercury, dumped around the factory and in forests, continues to contaminate soil and groundwater, affecting thousands. The workers cannot afford private healthcare, and have been fighting since 2001, asking Unilever to clean up the toxic contamination, and to compensate them for their medical expenses. Hindustan Unilever (the Indian subsidiary of the Anglo-Dutch giant Unilever) is avoiding its responsibilities to its workers exposed to mercury in the thermometer factory it owned in Kodaikanal and closed in 2001. Kodaikanal is a hill station retreat at 2,200 metres high in the flourishing forests of the Western Ghats of Tamil Nadu, South India. The factory site, as well as the surrounding area, are contaminated by mercury, including ground and surface water. Workers, local citizens and environmentalists have been fighting for the company to face its liability, also in the Madras High Court. Despite a partial decontamination of the factory site in 2003, the case is still pending and the conflict ongoing. The factory, placed in the middle of the city, produced nearly 10 million thermometers a year (about 75.000 a day) for export to the West. It is the story of how a global corporation took advantage of lax laws in a developing country to run a second-hand plant full of ageing equipment that compromised on safety and waste management. In fact, the mercury thermometer factory was relocated to India in the early 80s because it was too dangerous to run in New York, and would not comply with US legislation. In early 2001, public interest groups unearthed a pile of broken glass thermometers with remains of Mercury from an interior of part of the shola forest, which they suspected could have come from the company. In March, a public protest led by local workers' union and international environmental organisation Greenpeace forced the company to shut down the factory. Soon the company admitted that it did dispose of mercury contaminated waste, but refuse to face its liability. 550 men and women claim that their work at Hindustan Unilever's Kodaikanal factory caused irreparable damage to their health. They say that at least 23 of their colleagues have died young, and that their causes of death reveal complications resulting from mercury exposure: lung problems, heart problems, and kidney failure. Most of the ex-workers report varying symptoms, including: headache, skin problems, eye problems, chest pain, dental problems, nose bleed, vomiting, blooded urine, breathing problems, impotency, irregular menstruation, miscarriage, giddiness, tremors, and inability to grip effectively. “These symptoms are classic symptoms of occupational mercury poisoning” Dr Linda Jones of Massey University, an expert in neurobehavioural assessment in mercury poisoning, commented to the magazine Frontline. “Mercury,” Dr Jones said, “is the third most toxic element in the world after arsenic and lead.” “Mercury vapour,” Dr Jones explains, “gets absorbed through the mucous membrane [when you breathe], gets into the blood stream, and goes straight into the brain.” The workers did not get any compensation, and they formed the Ex-Mercury Employees Welfare Association in the early 2000s. 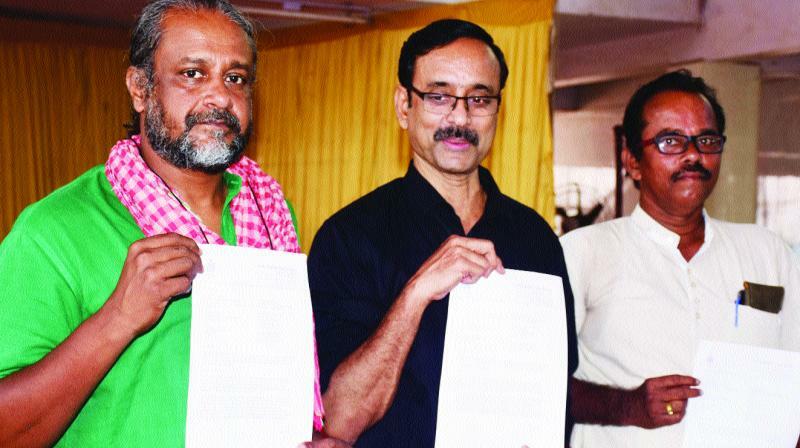 Their president, S.A. Mahindran, filed a Public Interest Litigation (PIL) suit in the Madras High Court. The association wants an economic rehabilitation scheme and a healthcare treatment and monitoring programme at the company's expense for everyone who ever worked in the factory. It also wants the company prosecuted. On the contrary, Hindustan Unilever denies that any of the health problems of the workers or their families was the result of mercury exposure in the factory.The levels of mercury to which workers were exposed are clear from the extent of pollution found on the thermometer factory site and beyond. The factory is located next to the protected Shola forest, considered to be an important biodiversity spot with over 30 endemic plant species. Part of the controversy has to do with how much polluted the site is. In 2003, the site partially got decontaminated, when over 28,000 kilos of partially treated mercury sludge from the site was hauled out and sent to the U.S. by the expert decontamination team. 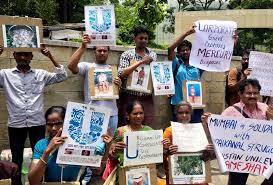 However, Hindustan Unilever admits that today over 360 kilos of mercury remain spread over the site. Workers and environmentalists insist that this is underestimated. The Department of Atomic Energy of Government of India found that the free mercury level in the atmosphere of Kodaikanal was 1000 times more than what is found in normal conditions. Analysis of water, sediment and fish samples collected from Kodaikanal Lake by a team of scientists of the Department of Atomic Energy showed elevated levels of mercury four years after the stoppage of mercury emissions. Moreover, townspeople and environmentalists fear is that the factory's mercury will convert into an even more dangerous form, methylmercury. This happens when mercury is worked on by bacteria in the environment. For instance, high levels of methylmercury were found in the nearby lakes. The company does not want to face its liability, for both contamination and workers' health. It has managed to persuade the authorities that its responsibility is limited to cleaning the factory site and no further. The controversies that motivate the conflict include: - Workers occupational health; - Failure to properly dispose toxic waste; - How much contamination is left on the site; - Whether the company met the Indian legal requirements during operation; - The uncertainty about the assessments in relation to both workers health and environmental contamination. - What the company admits (contamination of the factory site), and doesn't admit (mercury contamination and workers health). After a first wave of protest led by Greenpeace at the beginning of the 2000s that brought to the closure of the plant and partial decontamination, 2015 has been a landmark year. On July 30th a rap song  on the case became viral and was seen more than 3 millions times. As a consequence, the petition asking Unilever to take responsibility for Kodaikanal mercury poisoning got signed by 100 thousand people . However, although the company had to publicly apologize, it hasn't yet faced its liability which would mean cleaning up their mercury mess in Kodaikanal and compensate ex-workers. The campaign organisations The Other Media, Chennai Solidarity Group and Jhatkaa.org called the settlement a 'fitting culmination of the 15-year campaign'. However, the fight is not over yet. Unilever is yet to clean up its mercury contaminated site in Kodaikanal as the mercury content in the soil does not match the international standard. HUL intends to leave 25 milligrams/kg of mercury in soil which is 250 times higher than naturally occurring background levels. Such high levels will adversely affect the environment and the densely forested Kodaikanal Wildlife Sanctuary. The clean-up campaign is being spearheaded by the People’s Union for Civil Liberties and Campaign to Cleanup Kodaikanal Mercury Pollution. In November 2017, a press release was organized to release the findings of these studies in Madurai. Addressing a press conference Prof. Murali, PUCL, Zoology Professor Dinkar from Madura College and Nityanand Jayaraman, a Chennai-based writer and activist associated with the Campaign to Cleanup Kodaikanal Mercury Pollution urged the district administrations to advise people to limit their fish consumption, and instruct Tamil Nadu Pollution Control Board to tighten clean up standards for Unilever’s contaminated site remediation. . Further action from the state government and the Tamil Nadu Pollution Control Board is still awaiting. Adverting to the IIT report, Prof. Murali said, “We want state government to take up a proper study to find out the nature of mercury contamination in the factory site and clarify this to people. If government fails, we will organise a state level protest to sensitize people.” . New campaign and song by T.M. Krishna and others in 2018, "Kodaikanal still won't"
Project Details Hindustan Unilever Limited (HUL) is an Indian consumer goods company based in Mumbai, Maharashtra. It is owned by Anglo-Dutch company Unilever which owns a 67% controlling share in HUL as of March 2015 and is the holding company of HUL. HUL's products include foods, beverages, cleaning agents, personal care products and water purifiers. Hindustan Unilever's distribution covers over 2 million retail outlets across India directly and its products are available in over 6.4 million outlets in the country. As per Nielsen market research data, two out of three Indians use HUL products. The factory imported mercury from the United States, and exported finished thermometers to markets in the United States and Europe. Around 2001, a number of workers at the factory began complaining of kidney and related ailments. 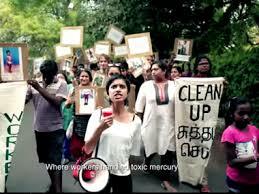 Public interest groups such as Tamil Nadu Alliance Against Mercury (TNAAC) alleged that the Company had been disposing mercury waste without following proper protocols. In early 2001, public interest groups unearthed a pile of broken glass thermometers with remains of Mercury from an interior of part of the shola forest, which they suspected could have come from the company. In March, a public protest led by local workers' union and international environmental organisation Greenpeace forced the company to shut down the factory. Soon the company admitted that it did dispose of mercury contaminated waste. The company said in its 2002 annual report and its latest Sustainability Report that it did not dump glass waste contaminated with mercury on the land behind its factory, but only a quantity of 5.3 metric tonnes of glass containing 0.15% residual mercury had been sold to a scrap recycler located about three kilometers from the factory, in breach of the company procedures. Quoting a report prepared by an international environmental consultant, Unilever said there was no health effect on the workers of the factory or any impact on the environment. Why? Explain briefly. The factory has been closed, however the site has not been decontaminated, and the workers had not been compensated until 2016, when there was some monetary compensation. However, many health damages were irreparable. "Poisoned ground" by Sarah Hiddleston at Frontline magazine. Petition: "Unilever – take responsibility for Kodaikanal mercury poisoning"
 Song: "Kodaikanal Won't" - Written by Chennai-born rapper Sofia Ashraf and set to Nicki Minaj's “Anaconda,” the video takes an undisguised jab at Unilever for its failure to clean up mercury contamination or compensate workers affected by its thermometer factory in Kodaikanal. New song, 2018 by T.M.Krishna, Sofia Ashraf and others. 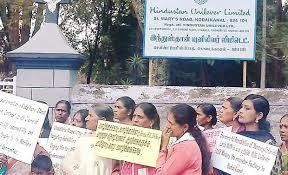 Three years ago, Unilever broke its silence on the mercury mess in Kodaikanal and compensated 591 of its ex-workers. But the factory site continues to be tainted with toxic mercury today. Other Comments References to UPDATE section in Sources of Conflict, added in 2017.